For all of the features built into iOS, a relatively important one is lacking: you can’t easily save SMS messages only from iPhone and keep them safe on your computer. We all know most of the data on the iPhone including text messages can be backed up via iTunes through the backup option. However, you can’t read the backed-up messages as normal on your PC or Mac. Thankfully, there are still other ways to transfer text messages from iPhone to computer. Just check the following guide. To save text messages from iPhone to computer, first you need to back up the content on your iPhone to iTunes. This is very simple. Run iTunes and connect your iPhone to computer via an USB cable. Then choose File > Devices > Back Up Now to generate a backup of your iPhone. Wait until the syncing is done. If you’ve synced your iPhone with iTunes before, just skip this and direct to part 2. 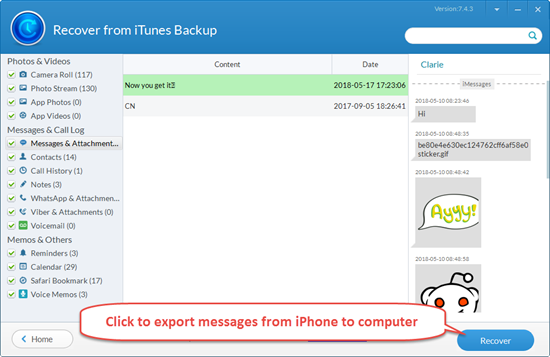 After you have backed up your iPhone to iTunes, the iPhone Backup Extractor will help you export iPhone messages from iTunes backup and save as several readable formats like TXT, CSV, and html file on your computer for better viewing. This tiny useful tool can also export contacts, call history, photos, videos, notes, WhatsApp and so on from iTunes backup and save them on your computer. Step 1: Install and run iTunes Backup Extractor. It will automatically find and show all the iTunes backups on your computer. Step 2: Choose the matched iPhone backup file containing the text messages you want and click “Next” to continue. Step 3: Select the “Messages” and “Message Attachments” from the listed file types, then click “Next” to begin scanning. Step 4: After scanning, view and check the SMS messages stored on the backup. Step 5: Finally click “Recover” to export them onto your computer. If you accidentally lost or deleted important messages from iPhone, you can also use this iTunes Extractor tool to recover deleted messages from iTunes backup. Ahtough iTunes Backup Extractor is such a great tool for extract iPhone messages, it won’t work if you don’t have any backup. If you want to skip the part of syncing device with iTunes and directly transfer text messages/iMessages from your iPhone, you can use another powerful tool Gihosoft iPhone Data Recovery. Install and run Gihosoft iPhone Data Recovery and select “Messages”. Connect iPhone to computer and click Next. Scanning for iPhone texts, and then click “Recover” to export messages from iPhone. Also, Gihosoft iPhone Data Recovery tool allows you to directly print messages from iPhone even without AirPrint. 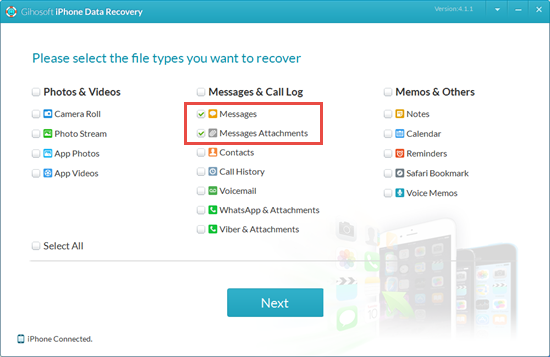 And if you accidentally lost or deleted precious messages from iOS device, you can retrieve deleted messages only from iPhone or even iCloud backup with this tool. Did this guide help you out? Are there any further issues that you may want to check out? 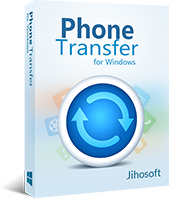 Please don’t hesitate to contact us via support@jihosoft.com. We will try our best to solve your problem as soon as possible.